Some folks call in Nutgrass. But actually the proper name is Nutsedge (see photo). You think you are getting rid of this very pesky weed because it is easy to pull. However, Nutsedge quickly grows back from the bulb-like roots that are left behind in the soil. Well now Ortho has a new ready-to-spray product called Ortho Nutsedge Killer For Lawns that will not only take out both Yellow and Purple Nutsedge, but also Wild Onion, Wild Garlic, Kyllinga and lots of other weeds without harming your good grass. I am very excited over this new product because up until this year I have had to tell folks that I did not have a suggestion to help them remedy their Nutsedge problem. It could be that your St. Augustine grass in the front will turn darker green in the next few weeks from your feeding. Sometimes it takes a couple of weeks for slow-release lawn foods to give you a greener lawn. 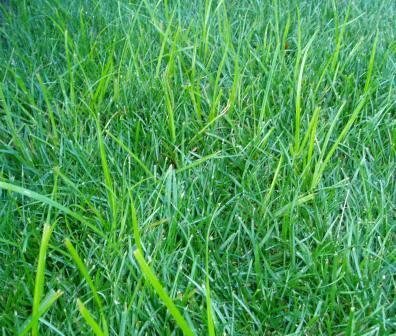 However, if the lime green grass you are describing looks more like a grassy weed that grows more upright than your St. Augustine and also grows straight up quickly between mowing, it could be Nutsedge (also called Nutgrass). If so, it can be killed with Ortho Nutsedge Killer.